I’ve only read one Jane Austen book and that’s P&P, but I kind of get the impression that writers 100/200 years ago tend to write like that…they really get all detailed and descriptive over the littlest things. I really enjoyed the 2007 adaptation of Persuasion. I think it portrayed more of a sense of urgency in Anne. She knows she is given a second chance with Wentworth and has to grab it. We often see Anne kinda breathless and there was that frantic run at the end. There’s another 1995 movie which I like too. And this one you get to see Wentworth in his naval uniform. If you haven’t watch Northanger Abbey watch the 2007 one…its real fun. As for Mansfield Park, I preferred the 1999 movie, it had more energy. The later TV movie with Billie Piper as Fanny Price was just too boring for me…but I heard it was more faithful? Apparently the 1999 movie was less faithful because it not only used the Mansfield Park book but also supposedly used Jane Austen’s personal letters when they characterize Fanny…so she was more witty and her tongue more sharper…I guess that’s why I like the 1999 movie better. I guess I’m one who love Jane Austen’s stories without really reading her books….just by watching most of the adaptations. I’ll have to check out the versions you mentioned; thanks for the recommendations! I haven’t seen the 95 Persuasion but I agree I like the urgency of the 07 film. 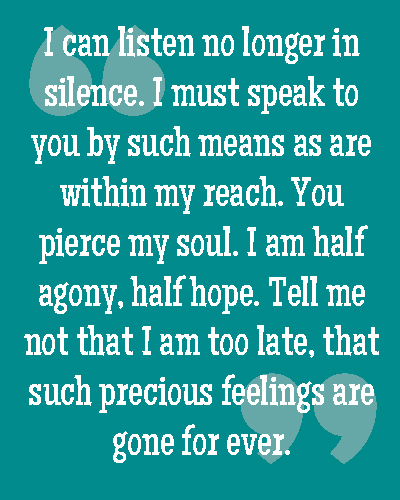 Persuasion is my favorite Jane Austen novel. I think as I’ve grown older I identify with Anne a lot more. I actually really enjoy the quietness of the novel and the angst that poor Anne goes through. I own both the 1995 and 2007 versions on DVD but I must admit that Rupert Penry-Jones makes a much hotter Wentworth. Sally Hawkins is pretty good but I hate how she acts with her mouth open for much of the miniseries. The 2005 version of P&P ranks in my favorite movies of all time. Keira Knightley and Matthew McFayden are my Lizzie and Darcy! I love everything about this version. There is an underlying angst in the novel, that is true. And Sally Hawkins’ open mouth, yeah, I’m not a fan of that either! I’d say 2005 P&P is in my top 10 fave movies, and it was my #1 fave for a while. I actually walked down the aisle at my wedding to “Liz on Top of the World” from the movie. I read P&P when I was a teen and while I liked it, I didn’t really love it. I was (and still am) a fan of classics, but while I appreciated Austen’s wit, I didn’t really connect to the writing otherwise. Like you, I came to love P&P through the 2005 film. A few years later, I tried reading Persuasion, but that didn’t work out. But I have since decided that I should give Austen another shot, so I do plan to read a few more of her novels (Sense and Sensibility Emma, and Persuasion, at least). 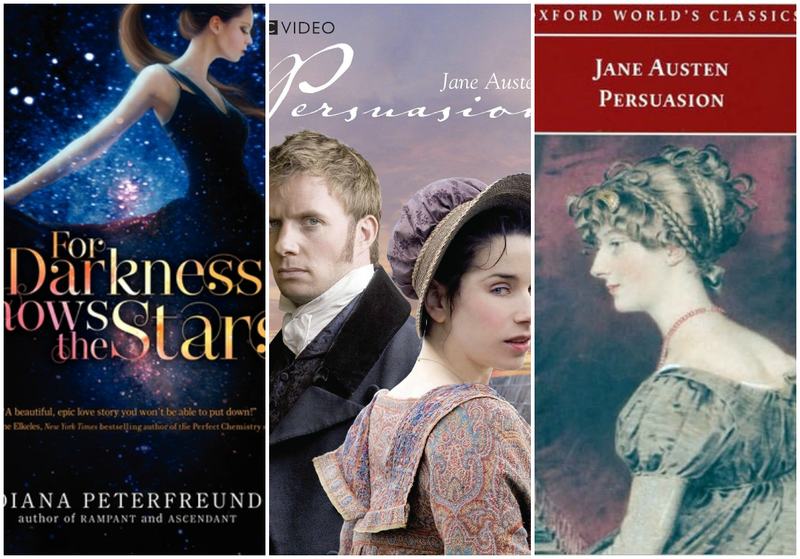 I have this sort of “rule” for myself in that I must read classics before seeing adaptations of them, so I haven’t actually seen any Austen adaptions other than P&P ones. Funnily enough, I just started reading Emma this morning to prepare for Emma Approved. We’ll see if my opinion of Austen’s writing changes; based on the bit I read earlier, I think there’s a chance it might. But I’m glad to see I’m not alone in having been ambivalent to her writing in the past. Man I am so excited about Emma Approved! I absolutely love the 2009 BBC mini-series version of Emma, so check it out when you finish the book! Love your blog! Katniss definitely deserves an ode. Love the Lizzie Bennet Diaries! I guess I just love good adaptations of Jane Austen stories! And thank you! The modern of Sense and Sensibility sounds interesting, though it’s too bad it’s not blowing away. I’m only a few chapters in, so it could pick up yet!